Real Muscle contains super potent & bioavailable ecdysterones for maximum protein synthesis. Introducing REAL MUSCLE, the Ultra-Premium Muscle Driver & Anabolic Activator from Modern Man Nutrition and true Stack-in-a-Bottle. We all know that building lean muscle starts with the BIG 3— eating enough of the right calories, training for strength and size, and getting eight hours or more sleep each night. 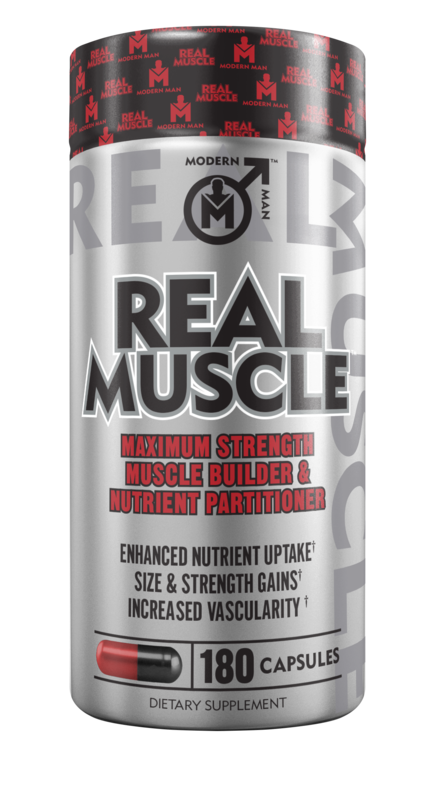 REAL MUSCLE provides an invaluable addition that helps to support your extreme effort with the right mix of clinically studied ingredients at fully dosed levels. REAL MUSCLE contains super potent & bioavailable Ecdysterones for maximum protein synthesis, and R-Lipoic Acid Sodium, the form of supplemental lipoic acid found in highest concentration in the bloodstream, essential as a cofactor for many enzymes involved in food-to-fuel process.